This year Handmade in Britain is working again in association with ARTS THREAD to offer 6 talented new graduates the chance to exhibit their work in the fourth edition of the successful New Graduate Showcase. Designer-makers will display their work in a dedicated gallery area and will also have the opportunity to attend a specialised workshop with ARTS THREAD and Piyush Suri, aimed at preparing graduates for the show and offering invaluable business advice to support their future careers. Location/Experience: 2015 or 2016 graduates from UK (England, Scotland, Wales and Northern Ireland) art schools and colleges. Exclusive graduate workshop with Piyush Suri on exhibiting, costs and business advice. Extensive press and publicity campaign and online event promotion in association with Arts Thread. Online listing with image on Handmade in Britain website. Coverage on Arts Thread and Handmade in Britain social media channels, website and blog. A colour image, write up and contact details in the show magazine. Complimentary tickets and private view invitations for your buyers and guests. Printed and digital promotional material for distribution within your networks. 24 hour security at the event. 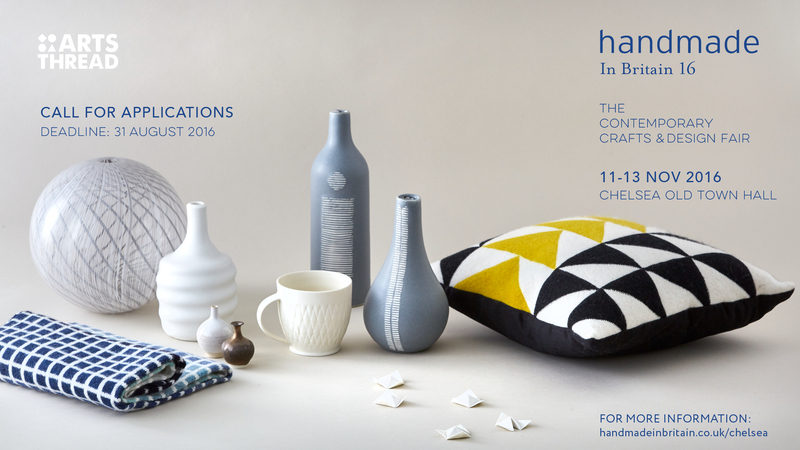 Handmade in Britain invites applications from designer–makers of contemporary craft, who produce their work in England, Scotland, Wales and Northern Ireland and work in the following areas: fashion design & accessories, interior design & accessories, textiles, glass, jewellery, paper, furniture, stationery, metalwork, ceramics, sculpture, woodwork, prints and etchings. The organisers seek to provide a balance of craft disciplines in order to provide the visitors with a broad range of work. If your work does not reflect the above categories, please get in touch with us to discuss what you do. Applications are assessed by Arts Thread and Handmade in Britain and assessment is based principally on the images supplied. Additional information on the application form may be used for press and publicity purposes once exhibitors have been selected. Makers must demonstrate a clear knowledge and understanding of the making process and provenance of materials used. The maker must have applied their craft skills directly in the creation of the work exhibited. They must have also given consideration to the commercial viability of the work, both in terms of its pricing and appeal to consumers. Handmade at Britain is marketed to and attracts professional, international and UK consumer and trade buyers; retailers from both independent boutiques and major retail stores; museums and galleries; design, interiors and fashion industry professionals; corporate and public sector buyers and collectors; local residents; tourists; shoppers and craft/design collectors. Selected press, buyers, media and VIPs are also invited to attend our private view opening evening.